Pancreatic cysts are collections of fluid that form within the pancreas*. The incidence of pancreatic cysts is increasing and most cysts are identified incidentally on imaging; indeed, around 15% of individuals going for abdominal MRI scan will have an incidental pancreatic cyst identified. Pancreatic cysts can be classified by secretions, by histology, or by risk of malignancy (as shown below). As a general rule, serous cysts are lower risk and mucinous cysts are higher risk. In 70% of cases, pancreatic cysts are asymptomatic, found incidentally on imaging. For symptomatic cysts, presenting complaints include abdominal pain or back pain (from mass effect and compression symptoms), post-obstructive jaundice, or vomiting. Examination will likely be unremarkable; in rare occasions, there may be a tender abdomen, a palpable mass, or abdominal distension. 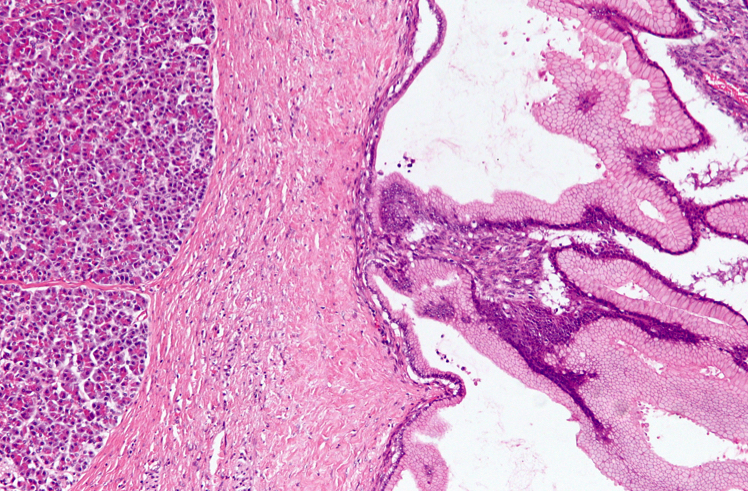 Pancreatic pseudocyst – this is a collection of fluid within the pancreatic tissue, typically forming following pancreatitis; the inflammatory reaction produces a necrotic space in the pancreas that fills with pancreatic fluid, however this lacks epithelial or endothelial cells surrounding the collection so is termed a pseudocyst. Pseudocysts are also commonly asymptomatic, so tend to be picked up on imaging. As suggested, most cases are picked up via imaging, however those cases being worked up for further management may warrant baseline blood tests, including FBC, U&Es, and LFTs. A CA 19-9 level can be helpful to monitor progression of the disease. 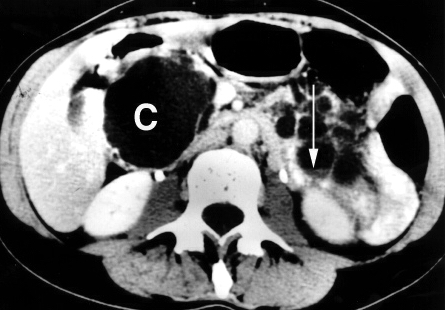 Current NICE guidelines suggest pancreatic protocol CT scan (Figure 3) or magnetic resonance cholangiopancreatography to further assess and evaluate pancreatic cysts. Imaging can be used to stratify those cysts that are low risk versus those that are high risk. Based on the features identified on initial imaging, further investigation may be warranted, either via complete resection (especially if high risk) or further testing through Endoscopic US scan with Fine Needle Aspiration (EUS-FNA). EUS- FNA allows for a biopsy sample to be obtained, which is useful in determining both low and high grade lesions. Most pancreatic cysts will be discussed at the multidisciplinary team (MDT) meetings, to plan for any further imaging, follow-up, or surgical intervention warranted. The majority of pancreatic cysts are benign and can therefore be left alone with surveillance only. In high-risk cysts, resection should be the first line of treatment, where feasible. There is no current consensus on the surveillance of pancreatic cysts following surgery, however in most cases a follow-up MRI scan every 2 years is reasonable. In those with low risk cysts, surveillance is recommended every 5 years, as the risk of malignant transformation is so low (put at 0.24% per year). Any rapid growth or suspicions during surveillance should be re-investigated and managed appropriately. The prognosis of these patients is highly dependent on subtype of the cyst and degree of invasion. Non-malignant and non-invasive cysts will have excellent prognosis, however malignant and invasive cysts have a significantly worse survival of 60% at 5-years, despite treatment. How do most pancreatic cysts present? For a low risk cyst, what is the risk of malignant transformation each year?